I am new to a leadership position and am learning a lot from you. I have managers above me and find it hard to manage. Is there a way you could address how to handle your own managers in some posts? Some things look good on paper (well, on screen for that matter) but are not practicable with supervisors. I find it difficult to voice my opinions sometimes and am not sure how to implement your ideas without swimming in dangerous waters. Thank you for your email and your kind words. I’m impressed with your comittment to be a person who takes action. Just how important are you? Gallop reports that engagement is 2% for employees who are ignored by their managers. When it comes to innovation and change, the most important factor for success, after senior executives, is MLMs. Your comment regarding the dangers of speaking up, “Swimming in dangerous waters,” speaks to the the attitude of upper management. Upper managers should make it easy for you to speak up. But, sadly, not all do. Listen to danger. If you ignore the danger of offending upper-management, you may not last long. #1. Utilize forward-facing curiosity. Leaders spend way too much time focused on past problems and way too little describing and working toward the future. When you sense danger or resistance, ask managers about their future goals. What issues might we encounter as we move forward? Reflect on the type of questions you ask. Are you looking toward the future or the past. Forward-facing curiosity enhances your authority. On the other hand, you look weak when all you ask about is the past. After asking questions, listen. Listening is your most powerful tool of influence. If you want your managers to listen to you, make sure they feel heard first. #2. Practice transparency. Secrets are dangerous. Discuss the same issues with several managers. Don’t play them against each other. Seek several viewpoints. Bring up differences of opinion when all parties are present. Be kind, open, and honest. #3. Understand and adopt the greater goals of upper management, even if you might disagree with their methods. What does upper management want? Profitability, employee productivity and retention? Perhaps the most important thing upper managers want is to look good to the executive team. Help your managers get where they want to go, as long as it won’t do damage. #4. Press through fear. It’s healthy to listen to fear. 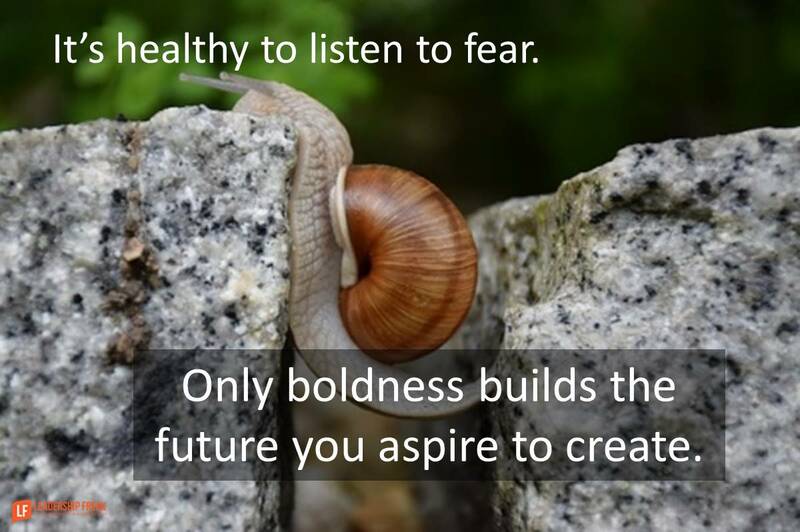 Only boldness builds the future you aspire to create. Courage is often a function of the people around us. What courageous person might you invite into your inner circle? What might you learn from them? Preparation answers fear. How might you prepare yourself for anticipated danger? Real courage does more than confront. It’s compassionate as well. Tell your managers what you intend to do. Don’t ask permission. When you’re concerned about the impact of your actions, say, “I intend to….” Ask for their suggestions. I want to say again, there is nothing wrong with feeling apprehensive about speaking up. I find that some of the most successful leaders I know are cautious. Their success depends in some degree on the sector where they work. You may be a person who likes to think everything through. (Perhaps too much?) Whatever you do, find a small imperfect step forward. What suggestions do you have for Swimming in the Middle? New managers need to be confident and show that confidence. Credibility goes a long way. Once you have that established fear will subside and others will expect you to contribute. Find a good mentor to learn from and observe how they handle situations. Listen, but then take action. We are waiting for you to lead! First, do not assume your bosses know how well you and your unit are doing. They don’t and you must “keep them informed.” No one else will tell them and they need ammunition for when their bosses ask how you are doing. Second, don’t feel compelled to be critical of people on your team unless they really deserve it, and you know what you want to do with them. The trap is that we tend to want people to know we have challenges and it is too easy to be overly critical. This sets you up for more intense, and perhaps unnecessary, scrutiny. Instead, be solidly supportive and complimentary to help create a positive and productive environment. This enables your bosses to be supportive when they interact with your team. Stay in touch with your manager no matter how bad it seems. Keeping him/her informed and doing your best is the only way you can show what your capable of. Stay on top of your game innovate and never talk badly about your boss or company. Time has a way of working things out and if your consistent and doing well you will stay in the game.